← NFL Season In Jeopardy As 76% Of Players Have Criminal Charges Or Investigations Pending. Players Voluntarily Turning Themselves In To Police. Pope Francis Modernizes The Swiss Guard Uniform. These Are The Real Fashion Police! He said he would modernize every facet of the church and he was not kidding! Gone are the days of the Blue, Red and Gold striped, court jester type uniforms of The Pontifical Swiss Guard! Out with the old boring blue berets! Like a fashion breath of fresh air, Pope Francis has opened up the closets and given the guards a makeover worth looking over and over. Working with designer Thom Browne, he has given a totally today, yet retro look to his most trusted security force. “These boys mean business with a serious military, yet whimsical look,” bragged Francis, “and the caps and plumage with optional aviator glasses will make you swoon. I know many of the cardinals did”, he said with a sly wink. 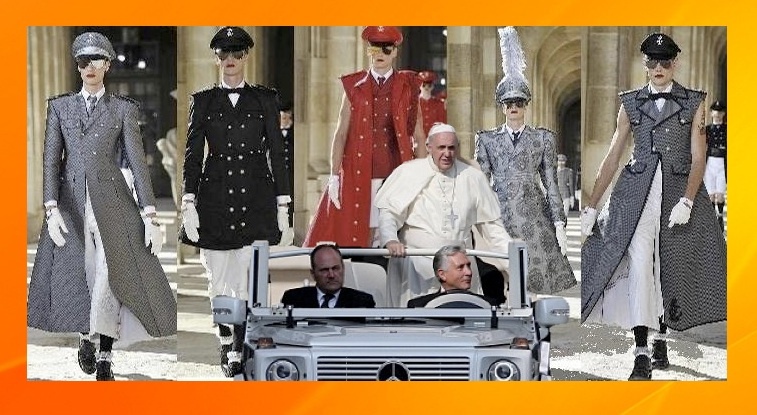 This entry was posted in Fashion Able, International, Scoop and tagged #Popefrancis, #thom Browne. Bookmark the permalink. 1 Response to Pope Francis Modernizes The Swiss Guard Uniform. These Are The Real Fashion Police! THE JESUIT SS CORP OOOHH PUULEASE!!!!!!!!! !